Sorry for my long absence and not having either photos or a discussion of melee marine units. I have to say that my hobby energy has been taken up by something else recently. Because I have this wonderful night desk job and have basically no one to talk to for those seven hours, I've been playing a lot of a new-to-me game League of Legends (LoL). Loki and I have both been playing, but being as his job is actually producing something, I have a lot more time to goof around with LoL. There are some things I really enjoy about LoL (if not it wouldn't be taking up my energy), but there are also some really bad things about it. First off, the basic structure of the game is that you and either two or four other random internet people join up to bash in the skulls of three or five other internet people by killing the and destroying their base. Each player chooses a character before the game, with no two being able to choose the same character as their teammates, and different abilities to go along with that champion. Each champion has its own abilities and unique style of play. During the game each player earns gold for killing various things in game and can spend them to buy items that buff their character in different ways. How each player decides to build their character will affect the game for the rest of the team and how the player should play their character. Depending on the group you get matched with your game can be abysmal because no one warns you that the other team might be ganging up on you or stellar, if your team can coordinate to gang up on the other team. If you're really lucky you'll get people who play your character also and will be willing to help you learn how to play that character better. If you aren't well you may be accused of having a mental disability. In the end it's all luck of the draw who you get matched up with unless you and some of your friends decide to invite each other to play. But this isn't a LoL blog, it's a 40k blog and I thank you for enduring that. Some of you know where I'm going with this, so (if of legal age) take a shot whenever you predicted one of my points. Unlike 40k LoL is a co-operative game and you always are helping and being helped by your fellow players in game. With 40k it's just you and your opponent who may only give you advice after the fact if at all. When you can get help with 40k is generally any time you're not in game as there are dozens of websites you can go to if all of your 40k buddies are asleep (like mine are now) or busy. In either case the advice you get can be good or bad (look for Advice Pete memes coming up), but the quality of the advice is only really as important as how much you put it into action. Before you play you get to choose a character in LoL and an army in 40k, though characters are much less expensive to acquire than armies. But like armies, each character is good at some things and horrible at others and knowing what your can and can't do with your chosen is vital to doing well with them. Also, armies and characters both have very distinct builds (e.g. 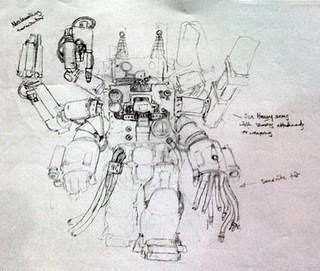 alpha strike, mechspam & DPS, tank), many of which you can also find on the internet. Like everything on the internet though Your Mileage May Vary with these builds. You've all heard of the units in 40k that are generally derided, but "well they work for me," e.g. vespids, and those that "take no skill" e.g. ... you know these already, moving on. 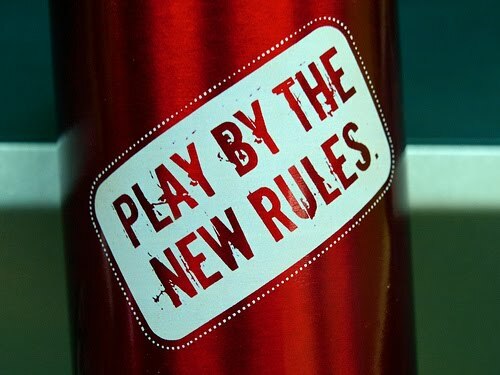 What matters with your choices is not whether it is the consensus, but whether it makes you happier to play than your next best choice. And that's the crux of the problem I'm having with LoL right now. I very much enjoy taking risks with my little cartoon man and that leads to me dying...a lot. There are people, as with anything on the internet, that take LoL very (even too) seriously. These people get offended when I fail at staying alive and winning, though I do understand that my failing pulls the team down as well. I don't mind people getting upset, but some of these people can get discourteous to the point that their mothers will leave the street corners to slap them. This makes me sad. I'm the kind of person who really enjoys making other people happy, but there is a lack of courtesy and any effort to help others improve in the people I've played with online. Which brings me to the best aspect of 40k, for me: our local community. Sure we can get mad at each other and the dice sometimes (I've been discourteous myself recently, sorry Zeb), but when the dice come down we spend more time talking about random things than we do playing. I've lost plenty of sleep listening to B go on about hilarious things and I've worried that Chuck would pass out laughing. the game is a lot of fun and what brings us together, but it's a great way to make friends and meet people. That is what I love about 40k and why I am glad to keep playing, especially with you all. So with rumors as to what sixth may be bringing to the realm of 40k, it is looking very similar to what was done with Fantasy. Quite a few major changes to the game can be noticed when looking at things such as game turn order, how specific mechanics such as Ballistic Skill and USR's work. Rumors also look to make IC's a little more scary on the table. The biggest one for me is how first turn is determined, and the idea of pseudo-stratagems being introduced. All of these seem to bolster the idea that 40k is going to be a massively different game. When talking with the folks down at our FLGS, both 40k players and non, the main reason for those who don't play is obviously the money... which given the current economic times is quite understandable. However the close second is simply the time it takes to play a game of 40k. In relative terms it generally takes about and hour + to play a good game at the usual 1850 - 2000 point level. That's a bit of time to invest in a single round of the game, and generally the want or time to play another round is often far off when I've played as well. With these new changes that we can only guess at now, it's still a mystery to me as to whether this new 40k (aka 6th) will effect the time it requires to play. My first guess is that it may increase the time to play, as there seems to be more to consider when it comes to situational questions and general rolling. The next topic of interest to me is the idea of first turn. From what it looks like, there is now a bidding war that happens by the players... and whatever points were not used to try and go first can be used to purchase some sort of stratagem style bolster for a unit or the army. This to me feels a little unbalanced. Now it fits with the concept that 40k has announced "We want 40k to be more about strategy than chance." This is fair, but the system they have created feels like it could be gamed fairly easily... but I'll reserve judgement until I see the official rules in the new BRB. In the end, I will look to 6th edition with great interest. I am not sure it is what I was wanting, but I have long felt that the love GW has poured into Warhammer Fantasy has been absent in 40k. With Fantasy getting full color codexes, fancy starter kits, rule overhauls, and generally faster FAQ's, 40k felt like the child they never really loved. Now is the time to see if this new overhaul of the 40th millennium will put the two games on a more level playing field in terms of quality. 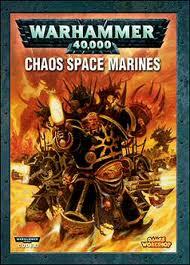 What rumors about the sixth coming of 40k have you most intrigued (for good or bad)? Any additional rumors that I missed? I look forward to seeing where it leads, but time will tell. 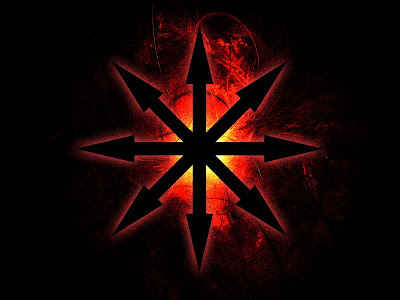 So it has been a long time since Chaos Space Marines have received much love from the dark gods of GW, and the few rumors floating around the interwebz have been few and far between, with the bulk of which surrounding the idea of chaos in the 6th edition box set. In my opinion, the codex still has a few nifty tricks up it's sleeves here and there, but against the ever growing number of 5th ed. armies it's age begins to show through rather quickly. 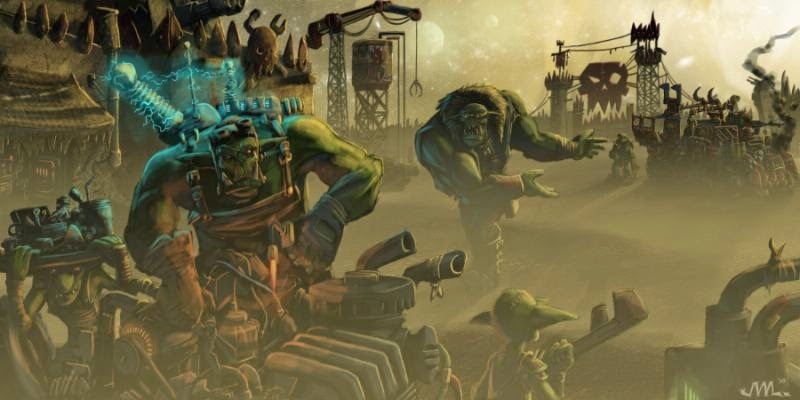 With several options in their troops section, as well as unique units like the Obliterators (though the Grey Knights try to imitate them) and tricks like Daemonic Possession, the armies of Chaos Space Marines have ways to keep pumping pain and heresy throughout the galaxy. But are all these options enough? Or are they possibly too much? Unfortunately I find it to be a little of both. In my opinion, the biggest change I see in the new armies that hit 5th is the points change. If you stop to look at units from 4th (or older) to 5th, their points generally lower, if only by a little bit. This "streamlining" often helps the army afford other things, be it entire units, more wargear, or a combo of the two... 5th armies can often bring much more to the table than the old expensive... and rather underwhelming units of old. I can attest to this with my Black Templar army. While I will still sing the praises of my one and only troop choice, it is somewhat disconcerting to pay 17 points a model for a marine who can be either duel armed or have a bolter, and only have frags... while wolves have both duel armed, bolters, frags, and kraks... for 15 points per. It's these points that are saved which quickly add up... and like other older armies, the CSM's feel it hard. So what can be done? I have compiled a few things I scavenged from around the internet, as well as a few ideas of my own that may hep to improve the codex. Again, these are a gathering of ideas, and not all are great.. but I could see them improving the army. 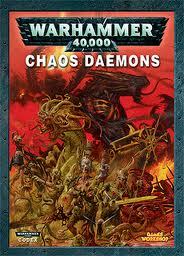 As much as I enjoy the concept of Daemons fighting alone, the two codexes could really do for a re-unification. I'll get to it later, but the use of marks on HQ's could help to improve lesser daemons into a version (buffed or nerfed) from the current daemon codex. 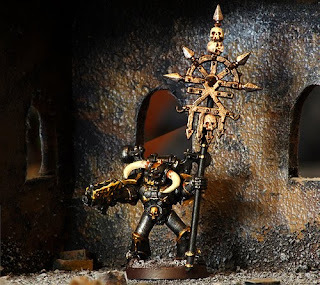 I personally feel like there is a lot of interesting uses for more potent daemon allies to the Chaos army, as the current daemons in the CSM army are limited severely in their uses. They aren't bad, but certainly not forgiving to bring in an army that is hurting for points as it is. While I understand the reason for cult troops being placed in the... well Troop section... I think there is a way to bolster their cult troops in a unique way to allow while keeping things fair. I like the 4 cult troops, but feel they could use a bit of a bolster... but if they become too much better than regular troops, they become OP. So make all cult troops in a non-troop section, placing Khorne and Nurge in Elites, Slaanesh in Fast Attack, and Tzeench in Heavy Support. Now before berating me here's the trick. An HQ with a mark (including unique characters) make that corresponding Cult Unit a troop choice. This could also come into play for the dameons if they were to be incorporated into the same codex. I personally believe the way to make this army stand apart from others is the put a little more emphasis on the Marks. This means that the cost of many of the marks could use a reduction to make them more accessible. If I remember right, the mark of Nurgle on Terminators is 50 points. That's pretty darn steep for a buff that disappears if the bearer is killed. On top of this... I feel the marks themselves could use a little improvement, at least where the cult troops are involved. I think plague marines could use true T5, and CSM with the mark would still only have the T4(5). 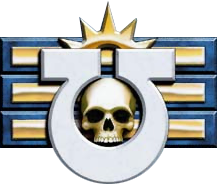 Minor buffs to the cults would make them feel a little more bang for the buck like than simply running cheap CSM units with similar effect. A last little trick I'd like to see is the inclusion of marks for vehicles. Each mark could have a unique buff to add to a vehicle. Khorne- Makes the vehicle an assault vehicle. Tzeench- grants the vehicle a 5+ invulnerable save. As for Daemonic Possession, this could allow daemons to be transported in the vehicle. I look at the CSM codex as one of limited options. "But Loki," you ask, "The CSM army has so much to choose from!" Yes it does... but in a way it limits you. For instance... there are only two transports in the whole army... the rhino (which you can't assault from, and the Land Raider which is 220 points for the same 10 cap as the rhino. This hardly compares to the loyal marines who have 4 transport options (and the LR has variants). I would love to see some new units as well as some nice new variants for existing units. Dreadnoughts could use for a bit of a tweak. Maybe a corrupted techmarine or something to keep the shenanigans to a low. We see this kind a thing already with the Dark Eldar Grotesques. The big thing here I'd like to see is the inclusion of cultists. I think there could be much fun to be had with a sacrifice engine. These could be cheap little 6 or 8 point models that can access wargear to bolster their own power and make for a cheap horde like troop choice, or just spam them to sacrifice to bolster other units. When I see Chaos, I think sacrifice... and this little unit could answer that gap nicely. I think these are just a few ways to add some flavor and power to the codex. There are some things that I haven't mentioned that would be nice to see back in the army. The inclusion of Legion characters (an Alpha Legion Raptor, Word Bearers possessed, or Night Lord Chosen upgrade character would be interesting). Not to mention the Holy Numbers. It was a nice way for fluff to interact with rules. 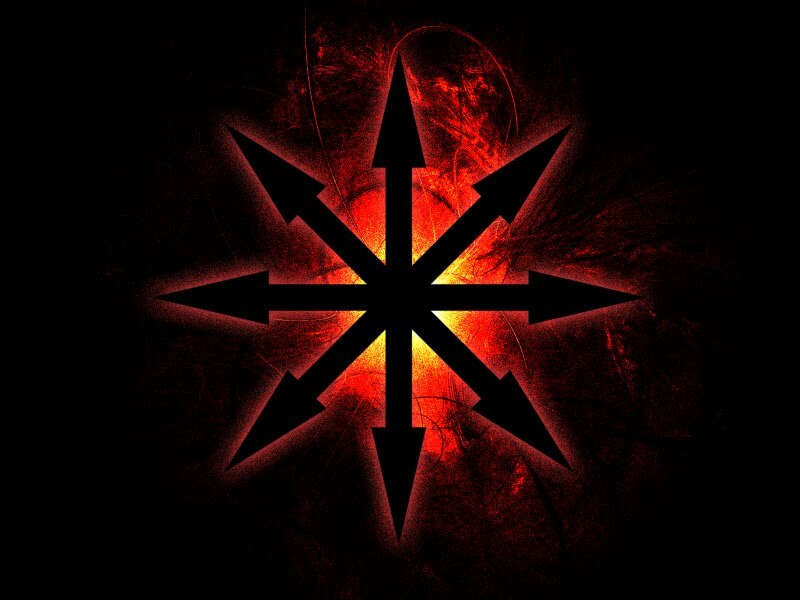 I also think you could make the rule heralds of the Chaos Daemons where an HQ with a mark can not join units with a different mark would be a nice touch of fluff rules. All in all, the codex works decently now. But if these addition/changes were made... I'd have to consider them as a next army. Any thoughts, or suggestions? Good afternoon everyone, hope you've had fun since I last saw you all. Last time I said I'd be posting some pictures of my Tau, but I haven't made any considerable progress on painting them, so hopefully I'll have something worth reporting next time. I will admit there are some problems with the comparing the blood angels' and space wolves' versions of this list. Coming from the space wolves side, the problem is that there are no tactical or devastator squads for direct comparison, so I substituted the space wolves closest equivalents the grey hunters and long fangs. Using a basic rune priest or wolf priest instead of Cassius and five man grey hunter squads with meltagun and combi-melta wolf guard instead of tactical squads and five missile long fangs instead of devastators brings the wolf variant to 1714 points for the same firepower as the 2000 points 'blue' marine list. That is a striking difference, though keep in mind that there are fifteen fewer bodies in the troops section than in the 'blue' version. For the sake of effieiceincy I'll give the wolves the win hands down. As a side note, the discrepancy in points between the lists drops from 286 points to 61 if you include the fifteen extra bodies. A wolves 'razor spam' list may prefer to run lascannons and twin-linked plasmaguns rather than assault cannons but their cost is the same so that shouldn't factor into the comparison, just in case you were wondering. Comparing blood angels' version of 'razor spam' is a bit more difficult because of their divergent (read heretical) force organization, it is impossible to have both three devastator teams and three autocannon dreadnoughts in the same detachment as both occupy a heavy support slot and blood angels do not have a master of the forge to move the dreadnoughts into another slot. On the bright side, I can decide not to care about that and compare the costs of each unit. Blood angels' obsession with speed means their razorbacks are fast, but they also cost fifteen points more expensive each. Luckily for them, their devastator missile launchers are five points cheaper each, netting them twenty points per squad. With three squads of each, the blood angels come out fifteen points ahead of the 'blue' marines. If they could have both the dreadnoughts and the devastators they would be slightly ahead of their 'blue' brethren, but they cannot. In the 'razor spam' department, the 'blue' codex falls behind the space wolves because they need to purchase more bolter brothers to access their meltaguns and missile launchers and have the melta and missile capacity of space wolves at a lower points level. On the other hand, having access to shooting dreadnoughts in their elites choices allows the 'blue' marines to field more long range anti-tank shooting than the blood angels. Out of the fifth edition marine codices, barring grey knights, the 'blue' codex falls between the shooting capacity of the wolves and that of the blood angels, netting the 'blue' book a solid okay rating. I'll try to cook up an assault comparison using the best close combat units from each of the codices to see if the 'blue' codex can hold on to its okay rating. On that note, what units would you like to see in that comparison, as I'm not the most familiar with any close combat units.